The 'Gravity' actor is known for his practical jokes and says one of his favorite pranks involves sending his actor friends into a panicked dieting frenzy by having their clothes altered so they no longer fit. He told the New York Post: "I do enjoy whenever an actor's trying to lose weight having the wardrobe people take in their clothes. "It just makes me laugh, watching them eating, like, a grape the next day. And they do it for weeks. It's good fun." 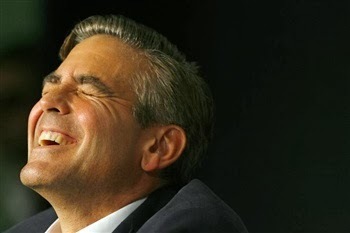 George was speaking ahead of receiving the Stanley Kubrick Britannia Award for Excellence in Film at the BAFTA Los Angeles Awards over the weekend and warned his friend and 'Ocean's 12' co-star, Julia Roberts - who presented him with the prize - to be careful with her speech as, he will be returning the favor when he hands out awards in the coming 2014 season. He joked: "I will take her down. She has to walk a little on eggshells with me right now." George's confession of his wardrobe prank will come as a relief to Matt Damon, as the 'Bourne Identity' star has previously admitted he was unsure whether he had been a victim of his friend's sense of humor. He previously said: "A couple of years ago I hadn't been working out and I'd got kind of fat. I had to go to a function and when I tried on my suit, it was too tight. "My immediate thought was that my buddy George Clooney had hired someone to get into my closet and cut down my clothes. I seriously thought that – until my wife said, very gently, 'Do you think it might be that you've put on some weight?'"